Congressmen Eliot Engel (D-NY) and Ed Royce (R-CA), current and former Chairman of the House Foreign Affairs Committee, respectively, discuss "Why Foreign Policy Matters" from a U.S. Leadership perspective with Meridian Trustee Alonzo Fulgham. As we mark the retirement of Congressman Ed Royce of California, who served ably as Chairman of the House Foreign Affairs Committee, it is worth noting that his cooperation with incoming Chair and then Ranking Member Eliot Engel reminds us of what can be accomplished if issues are approached with mutual respect and shared interests. 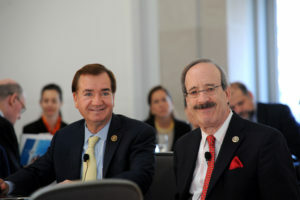 Congressmen Ed Royce (R-CA) and Eliot Engel (D-NY) at the 2015 Meridian Global Leadership Summit to speak on a bipartisan panel about U.S. leadership in foreign policy. Royce was widely respected for his deep knowledge on a range of foreign policy issues and chaired the Africa subcommittee, where he was instrumental in working with Democrats on President Bush’s landmark HIV-AIDS initiative, advancing trade, and building support for robust public diplomacy programs and international exchanges. Both Engel and Royce are well-known to Meridian International Center, particularly for viewing their own roles not simply as advancing America’s interest in a zero-sum fashion but rather looking at a strategic and long-term investment building diplomatic and international relationships around the world. Both possess a keen understanding that these relationships will be needed for effective economic and security policies in an interconnected world. 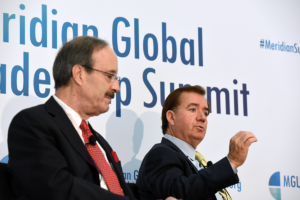 Congressmen Eliot Engel (D-NY) and Ed Royce (R-CA) on stage at the 2015 Meridian Global Leadership Summit. At the 2015 Meridian Global Leadership Summit, Royce and Engel took the stage for a bipartisan discussion on “Why Foreign Policy Matters”, examining through the lens of foreign policy, primarily, the impact on the everyday lives of people around the world, in the areas of safety and security, financial stability, economic development, and cultural diversity. It is reassuring that Congressman Engel will succeed Ed Royce in carrying on this unlikely bipartisanship in this fractured political environment. He will no doubt look for common ground with Ranking Member Mike McCaul of Texas who will bring extensive security experience to the table. As we seek to reassure allies and compete economically around the world, while simultaneously protecting our country, it is essential that there be close cooperation and an ongoing search for common ground as Congress plays an increasingly important role in international affairs. POST TAGS: Congress, Global Leadership, Global Leadership Summit.